Let’s head to your kitchen. Taste a bit of lemon juice or vinegar. Did you pucker? Now taste a tiny fleck of baking soda. It’s bitter, right? Lemon juice and vinegar are acidic, while baking soda is alkaline, or a base. Almost every liquid is either an acid or a base. Chemists know that acids have a lot of hydrogen ions. Bases have a lot of hydroxide ions. Why does it matter? When you understand acids and bases,you can use them in everyday life. Baking soda makes bubbles when combined with liquid and warmth. These bubbles make cakes, muffins, and cookies rise. Acids can break things down or corrode them. This is why you can use vinegar to clean windows. It breaks down grease and grime. A pH chart describes how acid or alkaline something is. A pH rating of 7 is neutral; 8 to 14 is alkaline; 1 to 6 is acid. Soil can be neutral, acidic, or alkaline. Some plants grow better in alkaline soil. Others need acidic soil. Some bases and acids are very strong and can be dangerous. Acid: A substance with many hydrogen ions, such as vinegar, orange juice, and stomach acid. Base: A substance with many hydroxide ions, such as baking soda, bleach, or soapy water. Visit PBS Kids for some kitchen chemistry experiments with acids and bases. 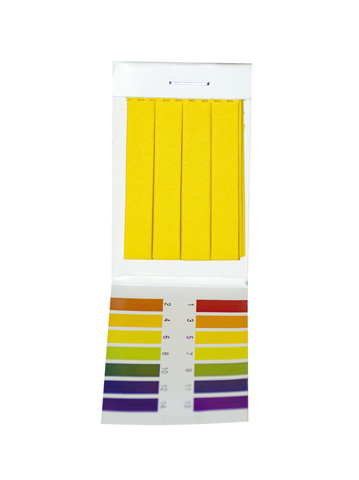 NeoK12 offers videos explaining the pH scale. Question: Are foods acidic or alkaline? Answer: Depends on the food. Most fruits, including tomatoes, are acidic. Vegetables are slightly acidic to neutral. Dairy products and meats are usually slightly acidic or neutral. Question: How do I know if something is acidic or alkaline? Answer: If it’s a food, you might be able to tell by taste. Acids usually taste sour; alkaline foods taste bitter. Bases turn litmus paper blue while acids turn litmus paper red or pink. Declan, Tobin. " Acids and Bases - Easy Science For Kids ." Easy Science for Kids, Apr 2019. Web. 21 Apr 2019. < https://easyscienceforkids.com/acids-and-bases/ >.